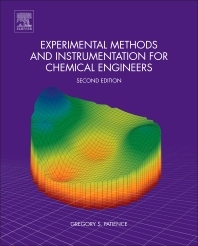 Experimental Methods and Instrumentation for Chemical Engineers, Second Edition, touches many aspects of engineering practice, research, and statistics. The principles of unit operations, transport phenomena, and plant design constitute the focus of chemical engineering in the latter years of the curricula. Experimental methods and instrumentation is the precursor to these subjects. This resource integrates these concepts with statistics and uncertainty analysis to define what is necessary to measure and to control, how precisely and how often. The completely updated second edition is divided into several themes related to data: metrology, notions of statistics, and design of experiments. The book then covers basic principles of sensing devices, with a brand new chapter covering force and mass, followed by pressure, temperature, flow rate, and physico-chemical properties. It continues with chapters that describe how to measure gas and liquid concentrations, how to characterize solids, and finally a new chapter on spectroscopic techniques such as UV/Vis, IR, XRD, XPS, NMR, and XAS. Throughout the book, the author integrates the concepts of uncertainty, along with a historical context and practical examples. A problem solutions manual is available from the author upon request.